The versatile Fiona never gets sidelined. We’ve worn it on cold days in December and chilly nights in July. We’ve worn it over satin and pearls, surf shorts and definitely over nothing at all. The exceedingly feminine and lightweight parka is made from a matte finish, 100% recycled ripstop polyester with a DWR (durable water repellent) finish and insulated with 100% Recycled Down (duck and goose down reclaimed from down products). Fiona has three hidden attachment points: one at the back neck and two on the cuffs, so you can pair this coat with our new and refined Lash Point rain parka for complete coverage in wet conditions. Front and back princess seams and curved quilting lines offer a contoured, but not overly snug fit that flatters the body and charms everyone else. 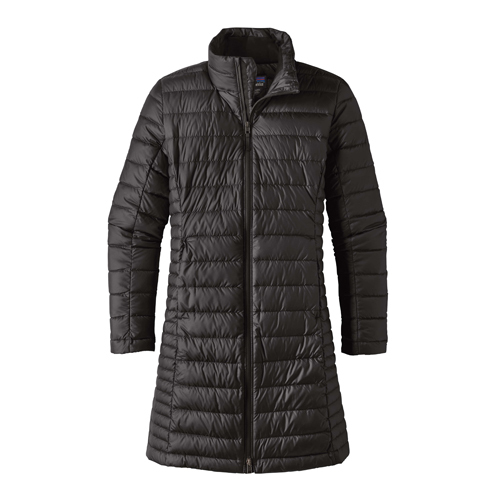 With a 2-way zipper, on-seam handwarmer pockets and a stand-up collar. Above-the-knee length. This parka comes with a handy dandy stuff stack. Quilting pattern has curved, feminine lines.